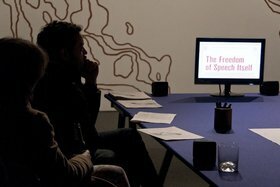 In a recent project with the Showroom in London, Lawrence Abu Hamdan presented The Freedom of Speech Itself (2012), an audio documentary that examined the history and application of forensic speech analysis and voice-prints in the United Kingdom’s controversial use of ‘voice analysis’. Accent, always a key signifier in determining an individual’s identity, has now become a means to proscribe and outlaw certain accents when determining the origins and authenticity of asylum seekers’ accents and their places of origin. Drawing on testimony from lawyers, phonetic experts, asylum seekers and Home Office officials, The Freedom of Speech Itself reveals the geo-politics of accents, and how such processes create newer and ill-defined states of exceptionalism when it comes to the rights of refugees. 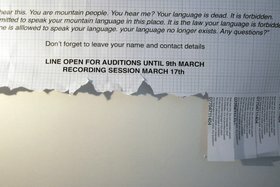 The show also included excerpts from Abu Hamdan’s audio archive and a workshop led by the artist on Harold Pinter’s play Mountain Language, written in 1988. In this conversation, Anthony Downey explores the motivation behind this work with the artist and how it has developed as an investigation into both the legal status of the voice and, perhaps more importantly, the legal implications of silence in the face of immigration laws today. Anthony Downey: You have had an ongoing working relationship with the Showroom here in London, where you developed a number of projects around the notion of the aural contract, the ideal of the voice, and what the voice means in relation to issues around migration and politics. This project is part of a broader context within the Showroom’s current activities – which is to do with communal knowledge and its dissemination – and I want to begin by just asking you how you developed this project during this time? Lawrence Abu Hamdan, Aural Contract: The Freedom of Speech Itself, 2012, installation view, The Showroom, London. Courtesy of the artist and The Showroom, London. 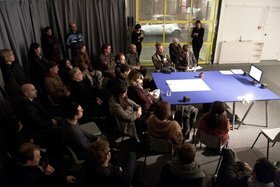 Lawrence Abu Hamdan: Aural Contract (2010–ongoing) is a project that began at the Showroom and was developed as a research project between Goldsmiths College and the Showroom. It started in a very different place to where it ended, which was positive. But the way my research was going at the time, and why I got the invitation from the Showroom, was very much to do with spaces made for the voice, the voice in politics and those kinds of relationships. The Showroom had asked me to do a project about communal knowledge because I had previously been doing projects that were easy to turn into workshop formats and had specific emphases on participating. They were performances in which people were wearing shoes that acoustically defined the architectural space in which they were travelling and so it was very adaptable to engaging with a given community through space. To develop this idea, I started thinking about a courtroom and the notion of how the voice can become a political agent. I proposed a series of workshops that referenced a whole set of interviews that I wanted to do simultaneously. It started as a set of interviews alongside a set of workshops. The workshops were done with children aged 11 to 15 and each week we engaged with a different practice of listening and speaking as defined by the different agents that inhabit the courtroom space. For me, that was very important because it was very much a process of practicing those ideas and hearing them in space. The project is so much do with those conditions of listening, that it was very important to appropriate these things and pull performance into it from the beginning. The documentary came out of that research but further down the line. One of the interviews I’d done in the first part of the Showroom project last year was with Peter French, a forensic audiologist who works with sound as evidence; all different types, including voice analysis, sound propagation, the authentication of recorded media. This interview blew my mind and then the whole research went off down that avenue. One of the things I encountered early on when I was asked to do a presentation at the UN Human Rights Council in Geneva was this question of ‘accent analysis’ of asylum seekers. The way I found out about that was because of a paper that was published by one of the linguists that I later interviewed. AD: With this question of ‘accent analysis’, you seem to be entering into an enquiry into what constitutes a legal or indeed an illegal voice. This seems to be increasingly about a zone in which the voice performs in order to gain access to a particular space; or the voice performs and is thereafter de-legalized, or outlawed. LAH: Yes, one of the main questions that came up for me when I encountered this idea of ‘accent analysis’ of asylum seekers was to see if their accent correlated with their claim of national origin. One of the first questions that came to my mind is what happens when we shift our listening to a testimony – drawn from the actual words we speak and their content – to how those words are being said, to the sonic object quality of the voice. A sub-question from that enquiry involves the legal status of our accents. When did the shift happen that meant that our accents had a certain responsibility, had a certain legal responsibility for explaining our origins and ethnicity? I was very interested in the collision between bureaucracy and the voice, which is a very much culturally produced object that has this whole biographical information that is gathered from childhood but doesn’t speak of a specific place but a movement through life, and the idea of citizenship, which is a bureaucratic distinction. So the collision between the idea of citizenship, which is something stated on paper, and something like the voice, which is very much culturally produced and constantly changing is where those questions started to arise. AD: Thinking about freedom of speech itself and the second installment of the project for the show, there are a number of elements that come into play that seem extraneous and yet obviously have a part to play. One of them is Harold Pinter’s play Mountain Language. Could you talk about how you came to that play and the relationship of Mountain Language to the overall context of voice analysis of potential immigrants and the outlawing of certain accents? LAH: It might be more important to explain here that the project uses an archive, a whole series of tracks as a device to explore a range of different stories related to the politics of listening. Each track in the archive is another way of telling the story that complicates the notion of testimony and free speech. So the example of the asylum seekers’ ‘accent analysis’ is one example of a larger project in which I am building on the idea of a contemporary politics of listening, and Harold Pinter’s Mountain Languagecame up because of another part of the archive, another track here that relates to my research on Margaret Thatcher’s broadcast ban on Gerry Adams and Martin McGuinness and Sinn Féin [the Irish Republican political party in Ireland] in general in 1988. I remember hearing Adams and McGuiness as dubbed characters, people who were always removed from their voice. They were dubbed because Margaret Thatcher said that no direct statements of Sinn Féin could be broadcast. But the media found this loophole, where it could interview Gerry Adams, take the sound off and dub him with an actor. I was really interested in that because some of the tracks from the archive are interviews with some of the actors doing those dubbings and they all explain a very different strategy of political agency. Some of them decided to represent Gerry Adams as a flat text, just to make it as clear as possible and avoid acting upon the censorship in that way; others wanted to embody Gerry Adams, with a Northern Irish accent to keep it connected to nationalism; and others wanted to perform the absurdity of the whole process, so they purposefully did a very bad lip-synching job so that the audience understood that they were both watching an interview with Gerry Adams and the whole absurd process of censorship. AD: They did this with political intent, drawing attention to the absurdity of a scenario where you see him speaking but the voice is apparently disembodied. LAH: Exactly. So what I was interested in was that political agency of acting and that year, 1988, was the same year that Harold Pinter’s play came out. He was informed by that but commonly it’s understood that he was informed by the treatment of the Kurds by the Turks and other injustices against language in general. I was very interested in how he shifts from a politics of language to a politics of amplitude and how that positions the audience in a kind of zone where they’re also policing who should and shouldn’t speak by virtue of the fact that it’s not an easy distinction to make between which characters should and shouldn’t speak. That’s why I wanted to do an audio version and insert it back into the archive, so it would be a process of adding another track to the archive and engaging with the politics of listening in a different way that is related to the question of asylum seekers but not directly. AD: I’m thinking about a number of things here, not least the fact that Harold Pinter’s hero was Samuel Beckett and some of Beckett’s plays deal specifically with the notion of the voice and its precariousness. I’m thinking specifically of Not I (1972) and Krapp’s Last Tape (1958). What strikes me about your show is a certain theatricality: it seemed to set up a stage for which the performativity of the voice becomes central to the piece itself, the aesthetic becomes about the performance of the voice. Does that have a resonance for you? LAH: Well, I certainly wanted the documentary to be the central part of the exhibition and it’s hard to do that sometimes in an exhibition room, because it’s invisible, it’s an audio piece. So, in the way that it’s centred in the room and the way that other elements spiral away from it and how people sit at the table to listen does give it some theatrical elements. In the construction of the documentary there are also some performances, some of them are constructed and some just are by virtue of the kinds of people we interviewed. My interest in the Pinter play and in realizing it was not to have it acted as such but to allow a set of audio technologies to be the actors, if you like; so the way that the voices were acoustically treated, the way that certain voices were distributed through certain speakers, the distortions that some had over others, was critical here. AD: It seems, as much as we are talking about the voice here, that a lot of what this work is also about is the right to silence: the legalistic right to silence, the right to not enunciate words, the right not to be de-legalized or indeed outlawed by what you say. So a lot of the material seems to be hovering between both voice, performativity, silence, and the renunciation of that space you enter in order to be accepted or not accepted. LAH: Definitely. Silence is also interesting in terms of the law because it’s a specific medium in terms of the words and the use of language that you can negotiate – so there is a lot that is legally inaudible, if you like. But perhaps one of the arguments of the documentary is to sort of work against the idea of silence becoming a shrinking territory. Where before, within the remit of silence, somebody’s accent was in part absent, legally speaking, that accent is now also embodied in testimony. The reason why the voice is so central to law is because it is this prime means of negotiating rights, there is no other choice but to speak and it’s so much to do with speech and the voice; there is so much of the legal process that cannot be written and signed to and delivered in that way, so much has to be announced, has to be adorned in oaths and all this kind of spoken legalese announced in certain places and heard by certain people. It’s also why I initially became so interested in it. There was a petition in the show to stop the use of ‘accent analysis’ on linguistic grounds. 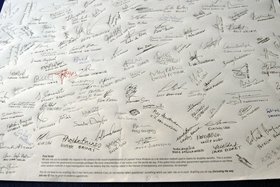 I drafted that petition with a lawyer – and as the post-script to a letter that will be sent to the Showroom’s local MP with all the signatures collected from the exhibition – which states that in the context of our accents being now used in evidence and in the context of voice analysis used as a kind of lie detection method, we need to shift certain legal terms around. So in terms of the right to silence, my amendment to that would be more like: ‘You have the right to remain silent; anything you do say, including the way you say it, can be used as evidence against you’. AD: Which is to do with the notion of prosody, the notion of enunciation and metrical structure, or the way in which something is said. There were a number of things I was thinking about here that perhaps take us back to the beginning of this conversation. It seems increasingly that the law is setting up states of exception and the proscription or containment of the voice has become a way of doing precisely that – the voice is now on trial so to speak. Whereas before this exceptionalism was based upon an epidermal, racist structure, whereby people were isolated because of the colour of their skin, it seems increasingly that the voice is now creating that state of exception. You work a lot with communities, and what I wanted to ask was whether they get what you’re working with, how do they react to the work itself and this use of the voice as an exception within the law? Did you find different reactions, did people see what was at stake here, or did they see it more as a conceptual gambit? AD: Which is precisely what’s at stake here. LAH: When I said that the interview with the forensic audiologist blew my mind, I really mean that in an uncritical way; in a way that’s very important to my thinking on sound, in the sense that it takes away all this talk about intangibility and immateriality, that the research of sound is crucial to these debates and puts it back to an idea of the voice as a print, as a material form; something that has an archaeology and geology to it. So there’s that reaction to the voice. Another set of reactions was a guy telling me that this was just a campaigning piece, he didn’t understand why this was a work of art, and he hadn’t heard the piece. It is like a campaign and I agreed with his view on the matter, but I asked whether or not he felt politics could be in the gallery and he said no – which in a way is the most political thing you can ever say: politics should not be in the gallery. So there was this reaction as well. Overall, the documentary drew a lot of people into the work, as the various people who were interviewed got to hear it and liked it. AD: So it was collaborative and there was room for feedback in relation to what had been produced? LAH: With the documentary, not so much, it was more interested in audio documentary paradigms, and it was me working with a radio producer. Of course, we sent it to them to know that they were happy with the content and how they were represented. AD: Did they sign off on it? LAH: They wrote an email. AD: This is all part of an ongoing project that I understand started in late 2009, and we’re now at the beginning of 2012. It seems that there is more life in this project – is that your expectation, do you see this developing into something longer-term? Is it a subject you would continue working with? LAH: Definitely. I feel like I still haven’t found the right way of showing the documentary so I still want to work with it and there are various invitations now, so I’m going to try a few different ways of showing that work in the immediate future. What this project taught me was the kind of excess that working purely with audio gave to the work, what could never be communicated in text coming through the audio-documentary process and audio essay format. So that was something that for me has opened a door that I really want to throw myself through, and understand how you can put the argument in the compositional structure of the piece, in the way you manipulate the audio and voice and these kinds of things. AD: So the structure of the argument is reflected in the aesthetic production of the audio itself? LAH: Yes, exactly, very much in the construction of the piece. And there are various moments of that in this documentary, which I want to explore further in future versions. Metro Goldwyn Mayer’s roaring lion was the first ‘non musical’ sound to be copyright protected. Families communicating across the Israeli/ Syrian border in the Golan Heights, shouting across physically impenetrable jurisdiction. All audio clips courtesy of the artist. Lawrence Abu Hamdan is an artist based in London, whose work is chiefly concerned with the politics of listening and the object quality of sound. Abu Hamdan’s first solo exhibition The Freedom Of Speech Itself (2012) at The Showroom in London is part of the ongoing Aural Contract project which has also been presented at Homeworks 5 Beirut (2010) and WYSPA IS Gdansk (2011). Other works include Model Courtat Chisenhale Gallery London (2011) and Marches for Artangel, London (2008). His hybridized practice means that he has written for Cabinet Magazine and the 10th Sharjah Biennial and is now developing a radio documentary trilogy commissioned by The Showroom London, Casco Utrecht and as part of a PhD at the Centre for Research Architecture at Goldsmiths College. Abu Hamdan is part of the group running Batroun Projects, Lebanon and 113 Dalston Lane in London. Downey, Anthony, and Lawrence Abu Hamdan. 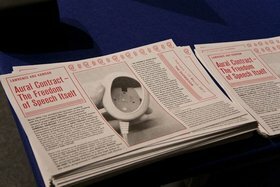 “Word Stress: Lawrence Abu Hamdan in Conversation with Anthony Downey.” Ibraaz. Ibraaz, 2 May 2012.